The Little Mother, this Norman Rockwell painting, appeared on the cover of Life Magazine published November 7, 1918. 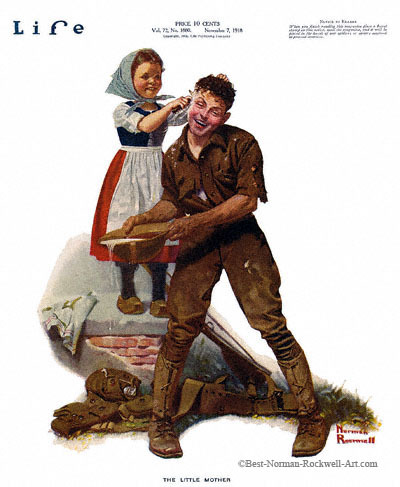 An alternate title for this illustration is French Girl Washing Soldier's Ear. This was the twelfth cover by Rockwell to appear on Life Magazine. A Rockwell painting appeared on Life magazine's cover a total of ten times in 1918 and twenty-eight times in all. In this painting, Norman Rockwell gives us a glimpse into post-World War I France. The war is virtually over. The Allied powers, including the French and the Americans, have defeated the Central powers, including Austro-Hungary and Germany. The American soldiers made all the difference in the war. Without American intervention, the outcome of the war might have been very different. This American soldier is smiling. His uniform is looking worn and, well, even kind of raggedy. But he is out of the trenches. He is off of the battlefield. His life just turned immeasurably better. The little French girl is also smiling. Her backyard is no longer a battlefield. Her life is no longer in danger from stray bullets or artillery shells. Her home is safe. While her life will be a while getting back to normal, at least now it is heading in that direction. She is helping the American soldier clean up. This may be the first bath he has enjoyed in months. The battlefield is no place to be worried about cleanliness. Survival and victory were the watchwords in that arena. Will he be headed back to the States soon? Will he mention the kindness of this little girl to his mother or sweetheart.